I remember Campbell’s Bean with Bacon soup making several appearances at my childhood table. I didn’t like it for the longest time. In fact, I didn’t like beans period. Especially baked beans. Clearly, I was a troubled child. I finally overcame my distain for these particular legumes, and embarrassingly enjoyed this sodium packed soup with my family often. The soup didn’t turn out quite a thick as the photo in the insert appeared, but that could easily be fixed by pureeing more beans. I didn’t, and I still loved it. While the soup reminded me of bean with bacon soup, the smell made me think of a mushroom pizza. Probably because of the roasted mushrooms, thyme and sage (great observation, Captain Obvious!). The roasted mushrooms alone were amazing, I could have probably just eaten the entire pan full, but because I didn’t have any more, I restrained myself and put them in the soup. Adding the crispy pancetta is an absolute necessity. If you don’t have it, or don’t want to spend the dough for it, bacon would be a fine substitute. 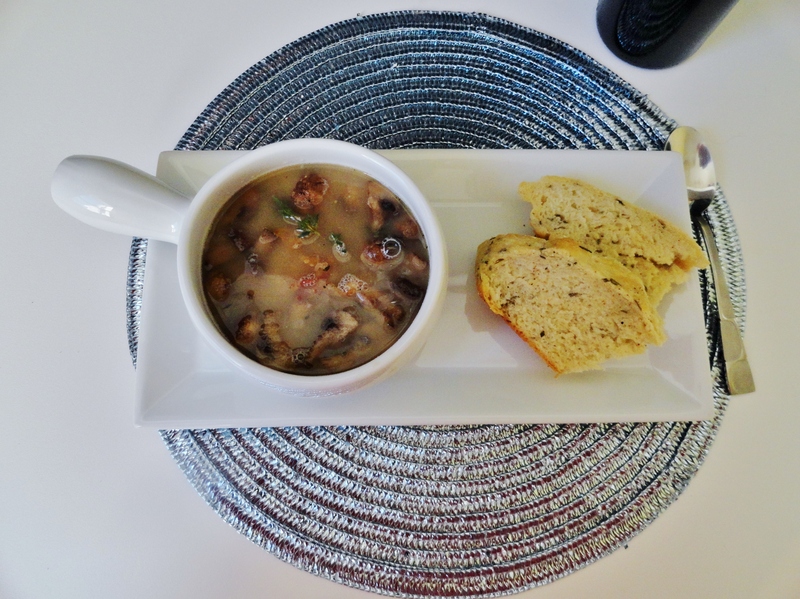 The crunchiness of the pancetta give the soup a balanced texture, while the salt really deepens the flavors. Serve with a salad or a nice hunk of bread (rosemary focaccia pictured above) and you have a wonderful, light but filling winter meal. 1. Drizzle olive oil in small saucepan over medium heat. Add pancetta and cook until crispy and golden, about 8-10 minutes. Remove with slotted spoon and place on a paper towel-lined plate. 2. Preheat oven to 450 degrees. Toss mushrooms, onions and garlic with olive oil, salt and pepper. Spread on prepared baking sheet. Add sage leaves and stems of thyme. Roast for 10 minutes, toss, and roast for additional 15 minutes. 3. While vegetables are roasting, add broth, beans, 1/2 tsp salt, 1/2 tsp pepper and 1 tbsp. fresh thyme leaves to a large stock pot. Bring to a simmer over medium heat. 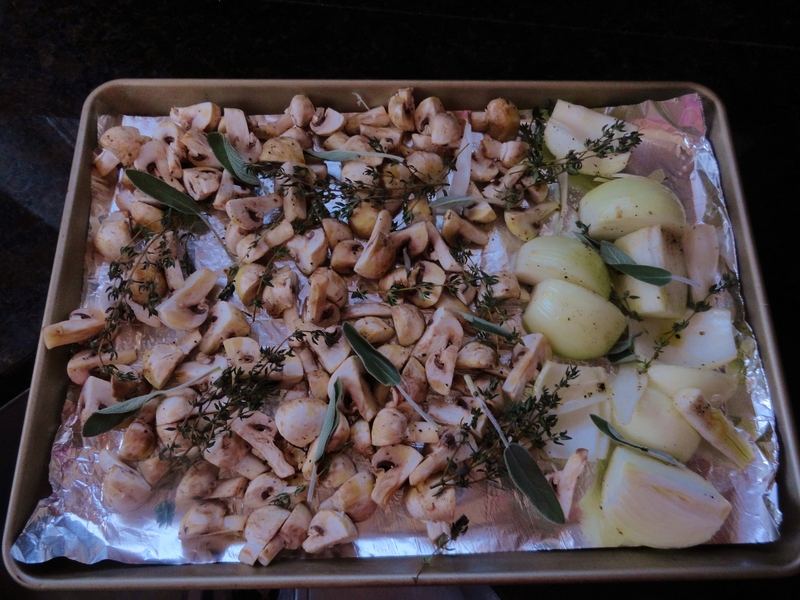 When vegetables are done roasting, separate mushrooms from onions and garlic. Retrieve 2 cups of the white beans and 1 cup of the broth from the stock pot. Add to food processor or blender along with roasted onions and garlic. Blend until smooth. 4. Add pureed bean mixture back to stock pot, bring to a boil and whisk until smooth. Reduce heat to simmer. Add roasted mushrooms to soup. Salt and pepper to taste and top with pancetta. It probably seems like we’ve been eating entirely vegetarian lately, but it just so happens, I’ve just had a lot of Meatless Monday’s in a row! I’ve kept myself busy trying out some veggie sandwiches for my girlfriend’s baby shower, which I still have one more to share, and have just happened across some other unignorably delicious meatless recipes. This quinoa salad does have butter, and while I think it would certainly taste good with oil in place of butter, I’m not sure you’d be able to achieve the depth and slight sweetness of brown butter with oil. The sage and brown butter are absolutely amazing. While this salad can be served chilled or room temperature, I think serving it warm brings out the best flavors! I liked this so much, you could serve this as a lunch or a side to any meal. We had dinner with Nate’s parents; Momma Marsha made mussels, so I brought this as a side. It went perfectly! 1. In a medium pot over high heat, bring the quinoa, shallot, water, and 1/2 teaspoon kosher salt to a rolling boil, stirring occasionally. Reduce the heat to low, and simmer until the quinoa has fully absorbed the water, about 15 minutes. Remove from the heat and set aside. 2. Preheat the oven to 400º. Toss the squash with one tablespoon of olive oil and season with salt and pepper. Place on foil-lined baking sheet and roast for 25 to 35 minutes, or until slightly browned and tender, turning halfway through. 3. Meanwhile, place butter in medium sauté pan and melt over moderately high heat, swirling the pan continuously until the butter begins to foam and just begins to brown, about 2 minutes. Remove from the heat and add the sage, swirling for another 30 seconds. 4. 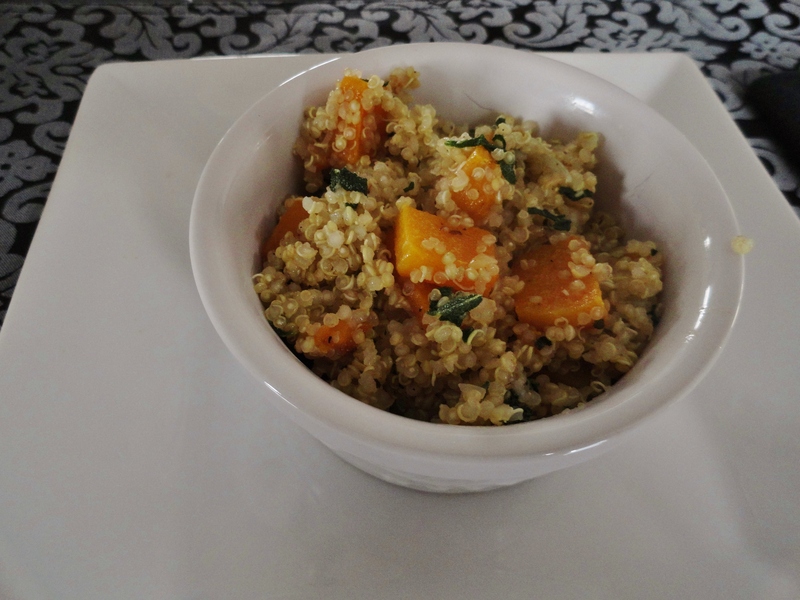 In a serving bowl, toss the quinoa with the butternut squash, and sage brown butter, and serve. It’s squash week! 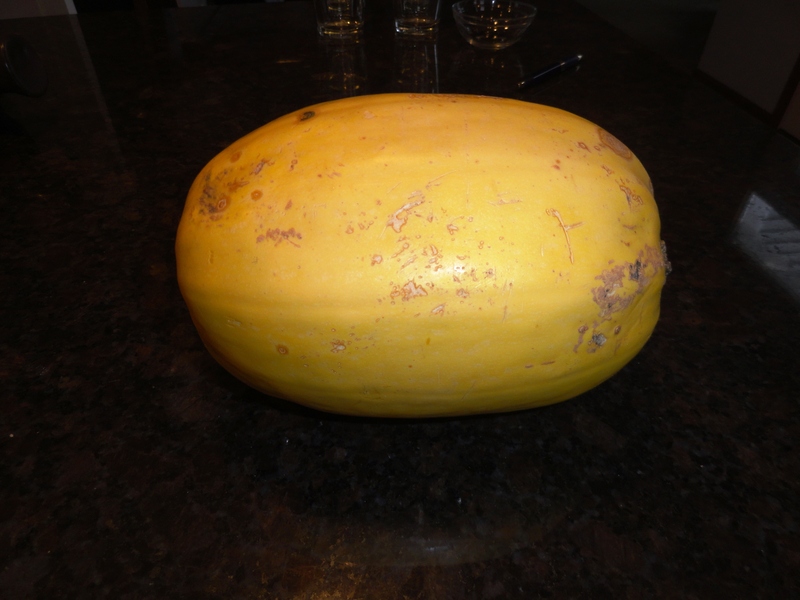 My last post was sausage and apple-stuffed acorn squash, and today’s gourd is spaghetti squash. I think the spaghetti squash is a very under used version, and it might be because people don’t know what it is. In case you don’t, here is what it looks like. 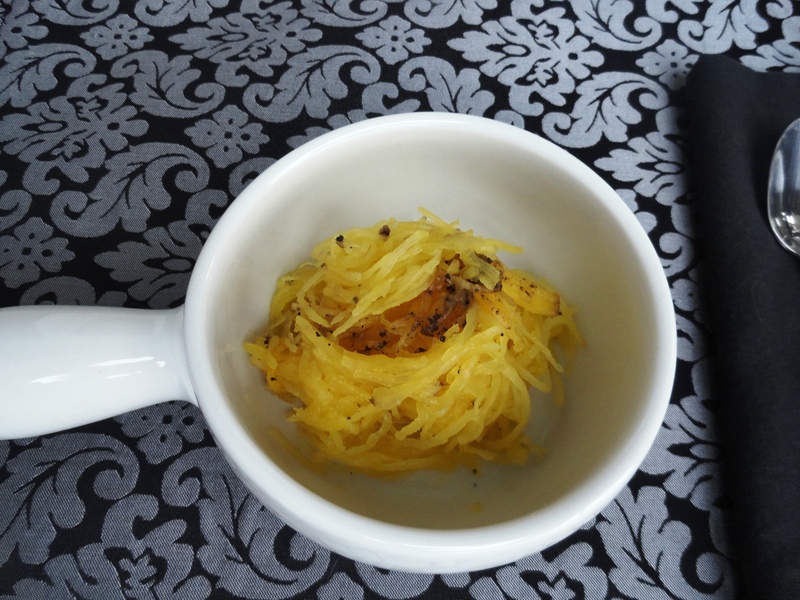 Our most common use for spaghetti squash is usually in place of spaghetti. The texture is similar, and it’s definitely lighter and healthier than pasta. But this time, I made it for my girlfriend who was coming over on Halloween night. I know…we’re crazy 😦 But, we did have a fantastic time passing out candy to the trick-or-treaters and wrapping up the night was Paranormal Activity 2. She said it was fine to watch, however, she was then terrified part way through. The recipe called for mixed wild mushrooms, such as king oyster and hen-of-the-woods. However, my local store didn’t carry them, and I didn’t want to make a trip to Whole Foods, so I just used shitake mushrooms. The soup turned out wonderful! 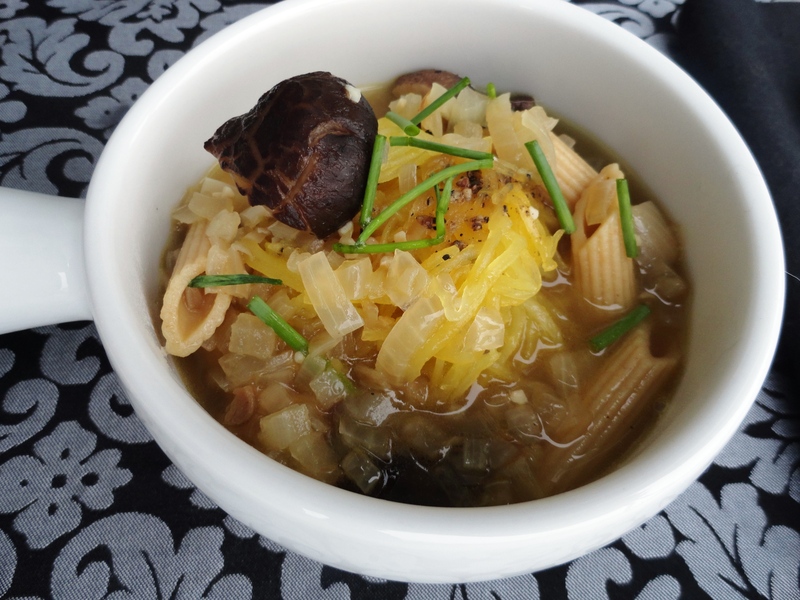 The mushrooms added a nice meaty texture, and the broth with the sage was bright and fresh. Adding in the roasted squash just added more depth to the soup. 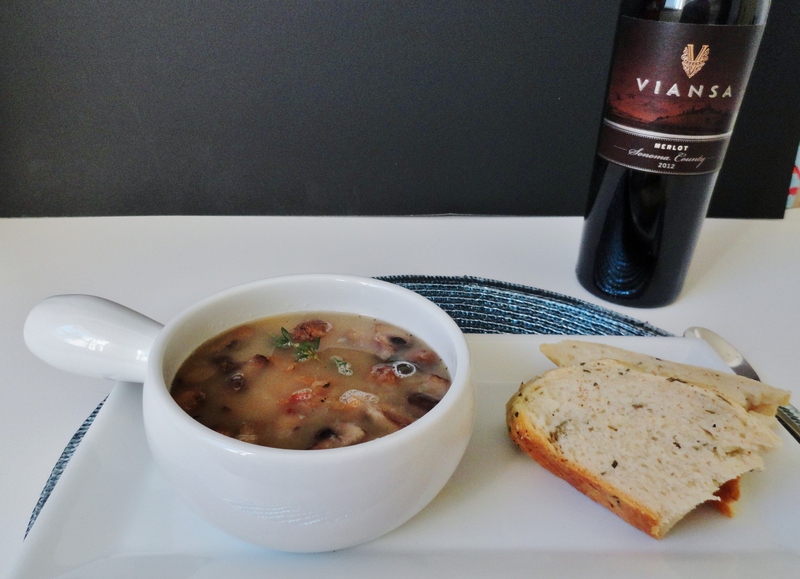 This is a great soup for entertaining, or even for a weeknight dinner on a cool winter night. 1. Preheat oven to 425 degrees. Drizzle cut squash with olive oil and sprinkle generously with salt and pepper. Place the squash cut side down on a baking sheet (I like to add a small amount of water in my baking sheet), roast for 30 minutes, or until tender. 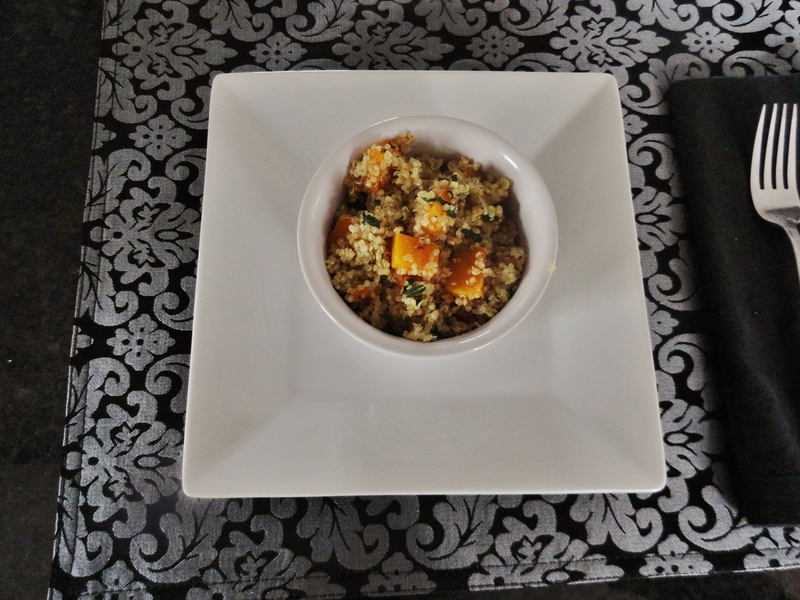 Once cooled slightly, use a fork to scrape the squash strands into bowls. Cover and keep warm. 2. In a large pot, melt the butter in the remaining 2 tbsp of oil. Add the onions and cook over moderate heat, stirring until golden, about 5 minutes. Add the mushrooms and garlic and cook, stirring until the mushrooms are golden, about 7 minutes. Add chicken broth and sage and season with salt and pepper Bring to a boil and add the pasta, cooking until al dente, about 9 minutes. Discard sage sprig and stir in 1/4 cup of the Parmigiano-Reggiano cheese. 3. 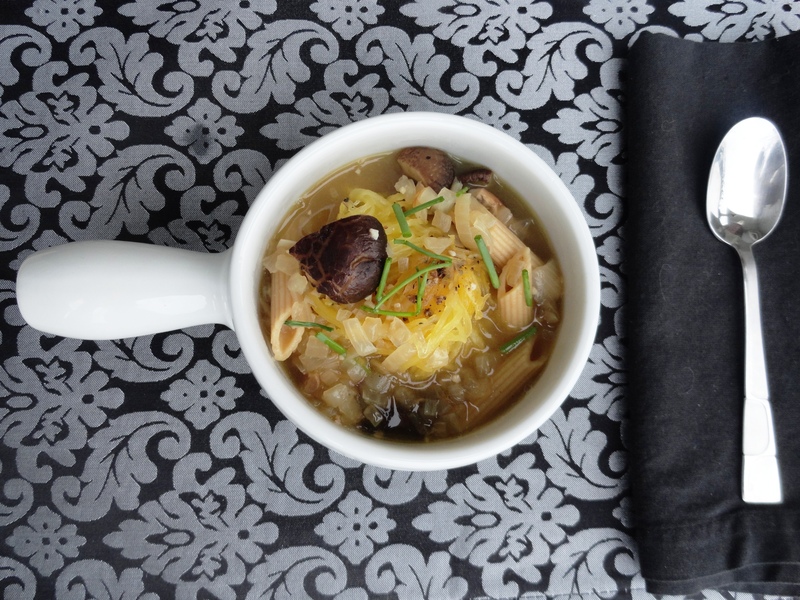 Ladle soup over squash and garnish with chives and grated cheese.